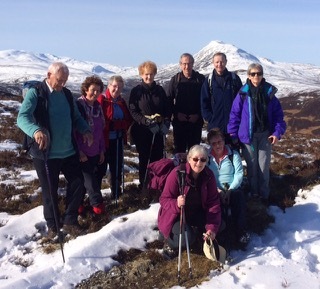 Strathtay and District is a small but active and friendly group with a fortnightly programme of walks all year round. Walks alternate between Saturdays and Sundays. The progamme ranges between Munros and low-level local walks, mostly in Highland Pertshire where we have a huge variety of scenic walks, but occasionally further afield. Visitors and new walkers are always very welcome. If you think you would enjoy walking (and talking) please feel free to join us for a few walks before committing yourself. If you are unsure of your fitness level then try a short and easy walk first. If you are not sure whether a walk is suitable for you, please contact the walk leader in advance. Walks generally start from the Car Park beside the Cooperative Store in Aberfeldy and those leaving from here generally share transport. We can always offer transport to visiting/ new walkers. Alternativley, walkers can make independent arrangements to reach the beginning of the walk. We warmly welcome anyone who would like to walk with us and look forward to seeing you. Join the Ramblers and become a member of Strathtay Group.